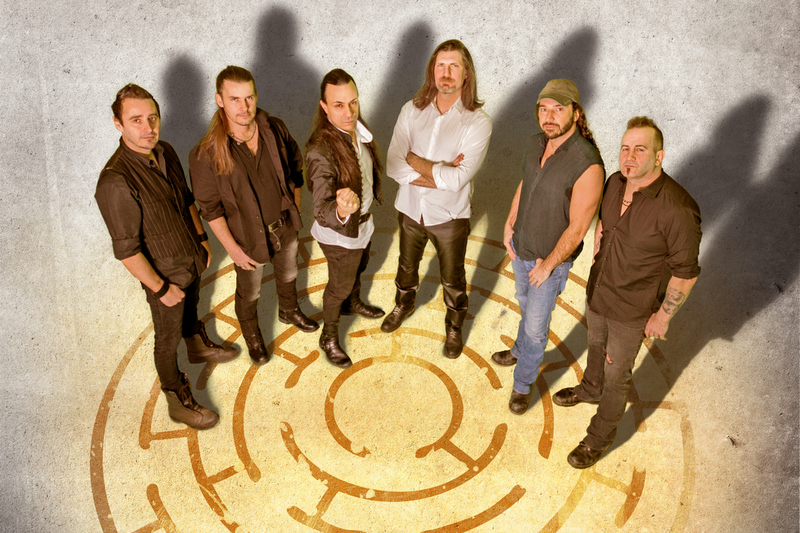 Nearly seven years after their last studio album, the Italian progressive/power metal band Labyrinth are back with Architecture Of A God. Founding guitarist Andrea Cantarelli fills us in on several new members, the album, touring, his other band A Perfect Day and other topics. Chad Bowar: What led to vocalist Roberto Tiranti’s return to the band? Andrea Cantarelli: Honestly, Roberto has never permanently left the band. Roberto decided to take some time in order to promote his own music. At the time the new ideas were not dedicated to another Labyrinth album, but simply as music made by myself and Olaf. We’ve worked together since 1992, so we’re used to writing music independently from Labyrinth. Of course we needed a singer in order to continue to work over the new songs, so me and Olaf decided to share our ideas with Mark Boals. Mark decided to pass on the deal with us due to a commitment with the Rock of Ages show. When Serafino and all the guys of Frontiers asked us for a new Labyrinth album, we discussed this opportunity first of all with Rob. Rob had finished the promotions of his solo album, then he answered with enthusiasm to our call. How did the rest of the new lineup (bassist Nik Mazzucconi, drummer John Macaluso and keyboardist Oleg Smirnoff) come to join the band? Oleg is part of an extended musician family since the band’s early days. Oleg was also part of the band Vision Divine in the past, and discussing the new Labyrinth lineup with Olaf to involve Oleg in the project was simply the best choice. Nik is a very valued bass player here in Italy. He’s a really nice guy as well. We met Nik before the recording sessions and since the very first rehearsal appears as the perfect bass player for the band. In order to have the best lineup possible, we decided to involve also a first-class drummer. John Macaluso was chosen from a list of potential drummers. But at the end his impressive drumming convinced the band to focus on him. How did the lineup changes affect the songwriting process for Architecture Of A God? In no way at all. Since the beginning, the songwriting is mainly done by Olaf, Rob and myself. I write with Olaf most of the music and Rob focuses on the melodies. If you speak about the arrangements my answer is totally different. To utilize Nik, Oleg and John during the recording sessions and mostly arranging the songs, was so important. The contribution of the “new arrivals” was really huge. How do you and Olaf divide the guitar parts? in a totally random way. (laughs) Seriously, is not so easy to answer to this question. I’ve played with Olaf for 20 years, so everything comes so spontaneously. We know each other 100 percent, so when we write the songs everything flows. I know how to support Olaf and how Olaf knows how to support me, musically speaking. We do not thing so much about how to divide the guitar parts, it simply happens. We would like to evolve as a band. As happened with the previous albums, we don’t like very much to repeat ourselves. We tried to make our sound more mature, but at the same time to put all the musical elements that distinguish us from other bands since the very beginning. What are the advantages and disadvantages of producing the album yourself? The main advantage is to have the chance to write, track, and mix the songs as we like, without any pressure from outside. It is a little bit risky to work in that way, just because sometimes to share our work with someone outside the band could be so positive. But in the end we know very well what the expectations are of the band and the expectations of our fans. We wrote a lot of albums and we learned a lot from past mistakes. The sound engineering part of the work is the final step and the most dangerous. You can ruin all the work with a wrong mix and mastering. But in this case, as we chose Simone Mularoni as sound engineer, we were confident about the final results. I really don’t know as honestly it is not a concern for me. I still play and write songs primarily for myself and for the wish to spend some really good time with the other guys in the band. I just hope that our fans will enjoy the album as we do. How was the video shoot for “Someone Says”? Are there plans to do more videos? We did the video shoot in a single day. We would like to share a not artificial image of the band. We are as you can see in the video, or in stage. We also filmed a video for the song “Bullets.” If the album sells well, of course, we will film some other videos. How important are music videos these days in the promotion process? it is so important due the importance of pages like YouTube. In 2017 you cannot do this work without thinking about the global scenario in which we live. The social networking is a big part of our lives (unfortunately, in my personal opinion). So to have the chance to promote the band using the internet is simply a must. You have a couple June dates on your calendar. Do you have any other tour plans? Yes. We’re working over a lot of shows all around the world. Of course we need also to wait to see if the album sells. To sell a lot makes it easier to promote the band live. With such an extensive catalog, how do you decide on a setlist? We try to extract the songs from every album we made, trying to balance the setlist with different kinds of songs, including our anthems like “Moonlight,” for example. And of course we choose the most fun songs to play live for the band, hoping that means a lot on fun also for our crowd. Is there a Labyrinth album you think was overlooked or underrated when it was released, but has really held up well? I think that Freeman was one of the most underrated album we made. The expectations from our fans, in 2005 was to have another power metal Album. But as I said before, we like to evolve as a band so we needed to record an album like Freeman. Actually a lot of people changed their opinion about Freeman, and I’m so happy about that. What was the response to last year’s A Perfect Day album, and what’s the status of that band? A Perfect Day generated a lot of interest, much more than I expected. The last album received a really good response from the fans and the media. Actually we’re working on a new one. We hope to find the right deal and release the new one in 2017 or the first half of 2018. I’m used to listening to different kind of music. Currently I’m listening to the last Fates Warning album, some albums of Anneke Van Giersbergen, Damien Rice and of course a lot of classics. Reign In Blood, Seventh Son Of A Seventh Son, Motorhead, just to mentioned a few, but also to more recent bands like Opeth. Follow our Facebook page for all the news related to the band. I just want to say thank you to all the fans that will listen to our music and to you for this interview. See you on stage!